Now, this is fun. The Jameson you can buy today is John Jameson–the brand from last week’s ad. 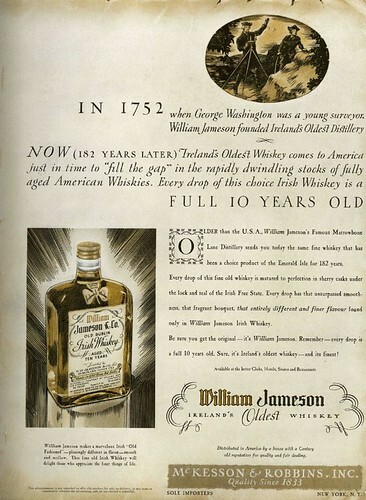 This is William Jameson, and if you click through, you’ll see William in italics throughout the ad, and you’ll see it in red type on the label. Sad story here: by the time this ad ran, the William Jameson distillery was closed, its stocks were being sold off, and its physical plant was being demolished to make way for housing. The site for the Irish Whiskey Trail has the full story. But I learned something about Irish whiskey when I was studying for BarSmarts, and now’s a good time to pass it on. Irish whiskey was once the dominant whiskey in most parts of the world, much the way Scotch whisky is today (everywhere except the U.S., of course). What happened to change this? First, it was the Irish war for independence that began in 1912. You see, one reason Irish whiskey was so dominant was that Londoners loved it. And when they colonized the rest of the world, they took it along with them. But when these upstarts in Eire got their knickers in a twist and kicked the English (mostly) out, London balked at Irish whiskey. Sales plummeted. At any other time, the Irish might have turned their eyes toward the American market. After all, think of how many Irish emigrated west in the 19th century. But, ouch. In 1919, Prohibition dropped itself onto America and suddenly the market for Irish whiskey nearly dried up entirely. Hundreds of distilleries across Ireland closed down during these years, and Irish whiskey as a product category very nearly completely disappeared. Of the distilleries open in 1912, only three survived to today. A few new companies have taken up the craft since 1990, but the Irish whiskey business is barely a shadow of what it was at its peak. Ireland’s Oldest Whiskey comes to America just in time to “fill the gap” in the rapidly dwindling stocks of fully aged American whiskies. Every drop of this choice Irish Whiskey is a FULL 10 YEARS OLD. Think about when this ad ran. 1935. Just two years after the ignoble experiment, Prohibition, ended in the United States. The ad’s correct; there would have been very little aged American whiskey in the U.S. Thanks to Prohibition, every distillery was shut down and every bottle (supposedly) destroyed. When production ramped back up with repeal, of course whiskey makers resumed distilling, but they would have had nothing ready for sale by 1935. It appears that the William Jameson company took advantage of this to try to unload its own remaining stocks into the U.S. market. According to the Irish Whiskey Trail site I linked out to above, the Wm. Jameson people even went so far as to blend their whiskey with young American whiskey in the 1930s, as a way to extend the life of its remaining stocks. Love this post series Michael, some of the old ads are just great. William Jameson was the son of John Jameson as in John Jameson whiskey. John the father (born 1740) set his sons up in the whiskey industry in Dublin, John Jnr in Bow St and William in Marrowbone lane on the other side of the liffey. It was a bot like Bobby and JR Ewing both in the same family but competing. Eventually the William Jameson Distillery merged with Dublin’s largest distillery, Thomas Roe and a couple of others to form DWD, but the merger didn’t work out. John Jameson and Powers were the main survivors of the great Dublin whiskies that once ruled the world. 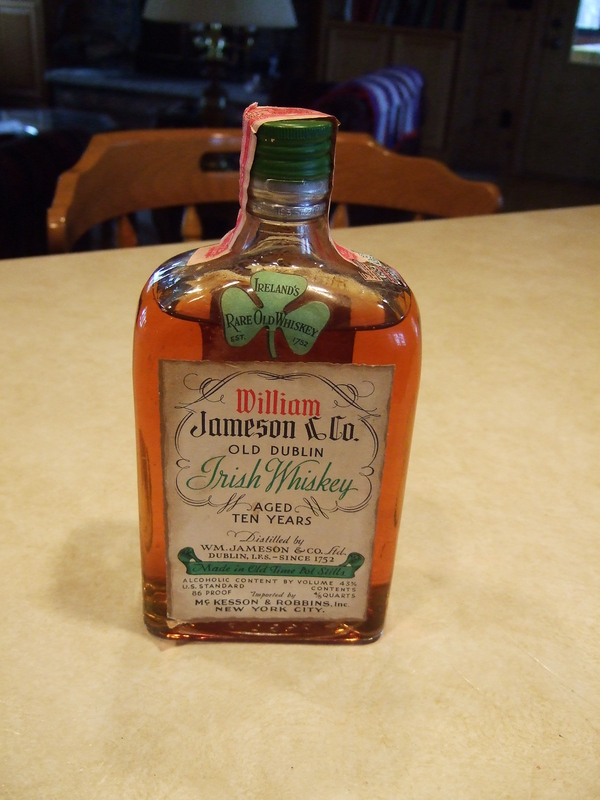 They say in 1860 Irish whiskey was 90% of all whiskey and that John Jameson’s whiskey was 10% of all Irish Whiskey. John Jameson (1740-1823) was a Scot, as was John Stein (1745-1825) who founded the celebrated Bow Street distillery that John took over and develop into a hugely successful business. Two of John Jamesons sons, John (Jnr.) and William, married two of John Stein’s daughters, Isabella and Janet respectively. The Steins were very big in the Scotch whisky world of that period, and were related to the Haigs, another major player in the Scottish distilling – indeed John Jameson (Snr.) was married to Margaret Haig……….. all part of the Scots/Irish whisky (whiskey) mafia. John and Margaret’s great grandson was the famous Guglielmo Marconi, the “father” of radio. Great information, Michael, thank you! I’m now almost certain that William Jameson did not marry Janet Stein, my source is wrong. John Stein had other daughters, and it may well have been one of them. Isabella certainly did marry John Jameson (Jnr). Janet married her cousin William Haig of that famous distilling line – their grandson was Field Marshal Sir Douglas Haig.